I have a RPI2 as Controller, with an UNO as Gateway connected via USB, version 2.1.1, with a NRF amplified. I have 3 nodes in home. 2 are temp / hum battery, no signing at all. 1 is the heater control, with a relay attached for the heater. This node is feeded with a Samsung 5V/2A. All network did work for last 6 month. Tonight, suddenly, the heater node lost communication, or better, did not receive command for the relay. on both gateway and nodes and.... all work like a charme. The node is an Atmega328 on breadboard @8MHZ, with amplified NRF, + screen + relay, as I did say. Now, for the moment it will be without security, but, just to understand, if someone on the neighborhood would "play" with my node, he could do it? I don't need security for a heater, but I would like only to have the WHITELISTING feature. IN next days I will investigate what could have done this issues, after about 6 month of small others issues but, of sure, no issues about the signing. Another question, I did update several time ago the library from Arduino update. Do you hint to delete totally from the folder, re-download and reinstall? Or the library on the official repository is the same? @sineverba Hi, it is hard to tell what has gone wrong with the signed messages without any logs to look at. My best guess would be that you have a NACK problem. As for the whitelisting feature, no, you cannot "only" have whitelisting. It is based on the signing feature and need it enabled in order to work. Interestingly I'm working through a very similar issue myself just now. The garage door opener just stopped working a few days ago. Added additional debug statements to MyTransport.cpp but haven't discovered anything yet. My experience is that the messages either never get received (no trace output) or the output ends at "Transmitted nonce". Randomly, it will work. It used to work just fine and I'm reluctant to drop the signing. So I'm definitely interested in how you get along and I'll update too if I get my end sorted. @brendanl as PHP developer, It is INCREDIBLE that a perfect working software, WITHOUT updates, suddenly crash. But It is. For now, I did disable the signing. Do you have inserted other nodes in the network? Changed some radio? I don know whats the failure. I did redownload library from github and tonight I Will reinstallare. I Will update the thread ASAP. Signing has an absolute requirement that the radio link works flawlessly. It will trow away or fail messages if any part of the exchange fails to reach the destination. So if you get any NACKs in the log, then those NACKs have to be resolved before signing can be expected to work. @sineverba The log will show if your messages come through or not (you need them from both the node and the GW to verify that). It can be a power issue, or a noise issue, or a neighbour buying some radio equipment that disturb your comms, or birds just crossing at a bad time. Hard to say, but I am inclined to blame RF for this problem and not signing (for this very reason). And as I have said, in many threads (and also in the documentation) the fact that it "works without signing" does not automatically mean signing is not working. It is normally just because with signing enabled, the RF link is put on stress due to the messages being much bigger. @Anticimex ok, I Will investigate more and more. Question: if I leave the Heather without signing, or a generic relay, someone "malicious" how could "play" with my relay? Need to have a portable controller and gateway and sniff when I poweron or poweroff the relay itself tto have the node in his controller? @sineverba With enough knowledge, only a gateway is needed. You can just use a terminal to send commands to the gateway. If your node ID is known and your radio address, then anyone could just send commands to it. They will need to know what command your node reacts to, but that can be obtained from sniffing the traffic (assuming you don't encrypt your communications). @Anticimex If i live at 4th floor of a Palace and the family at 3rd use MySensor, on same Channel also (! ), Is there the possibility that their Heather commands could be read and interpretated from mine ? (Or viceversa).... Thank you! @sineverba Not necessarily. You can validate that the message is from "some gateway", and that it is specifically of the type you accept. You can also enable encryption. I'm re-studying the API and specifically the signature / signing section. I did not understand something. I don't want open a new thread, ask here. If necessary, I will open a new one. It says "If used for a gateway, gateway will by default require signatures from ALL nodes[...]". I did enable this on the gateway (Arduino UNO). Q: In my network I have 2 nodes that transmit temp, hum and battery (atmega328). No signing at all in the sketch(es). Why they works without the SIGNING? What's a verifyng node cited on the explain? Another one node of my network is acting as a bridge beetween both? I am not sure. I assume you run the 2.2.0-rc.1 version on all nodes and gw? The documentation you read is for that branch (development branch). No, I meant "someone" could sniff. The library itself does not offer sniffing APIs. @Anticimex No, I'm running the 2.1.1 on all nodes and gw. In this moment I did re-enable the signature and signing software section on the gateway (but not in nodes, no nodes have signing enabled). All works. I can confirm. For the 2 (whitelisting) I did enable only on the node that require signature, i.e. the relay node. Not in gw, not in no others nodes. 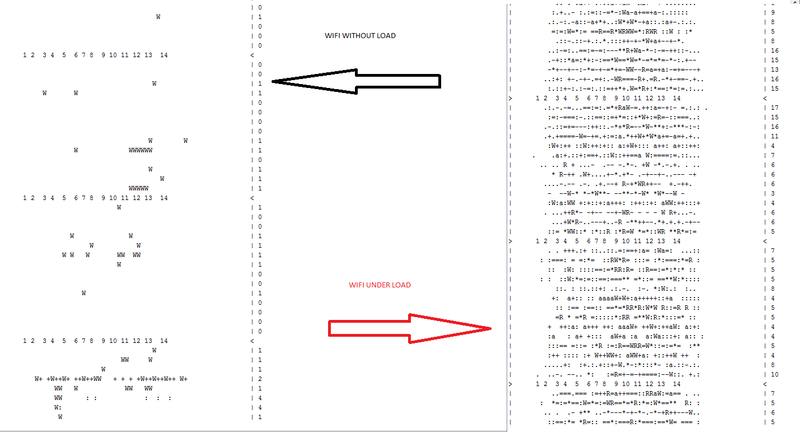 @sineverba your config seem correct. 4 - I did reinstall the Gateway sketch and the sketch for the relay heater, with signing. After 30 min, no working anymore...... Fake alarm.... maybe some trouble with breadboard, maybe oxyde.... I will test in some day on PCB. 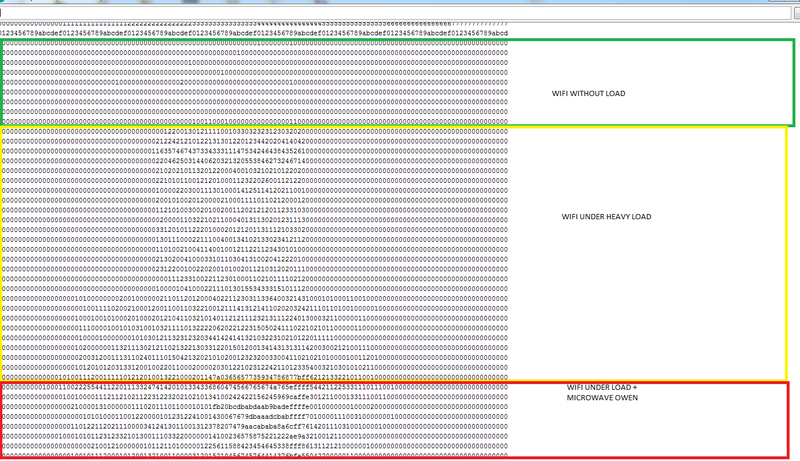 @sineverba uhm, if you cleared the eeprom, you have erased your personalization data. So now you run without a signing key. So your signatures are worthless. You also still run 2.1.1 because that would not work on 2.2.0,iy has checks for such things. You will need to redo personalization if you erase the eeprom. @Anticimex I did forget a step. I did reinstall the personalization also, but after 20/30 mins, all stop works. I could try also the 2.2.0rc. Do I need every node and gw on same release or can I mix nodes and gw between 2.1.1 and 2.2.0 ? @sineverba ok, I strongly suggest you instead just post your logs (or read them yourself). If you get NACKs, you can reflash and re-personalize all you want. Signing will never work as long as you get NACKs. You have to fix that problem by either tuning your rf settings, checking your rf environment or power supplies. Well I've just got mine working again. I'm putting it down to the birds not just crossing, but circulating for the last couple of weeks! After the work last night, I moved my Gateway into the same room as my node on the breadboard in order to swap radios and it instantly became more responsive (much less NACKs & much less randomness on signed communication). I continued swapping radios etc to at least demonstrate consistency/working radios, but the location improvement alone was a Big Clue! I have a NRF24L with the external aerial on the gateway, so was always expecting it to continue performing well regardless of what was around it. In my case though it was sitting above a metal 19" network patch panel & right next to a running laptop. Inside the patch panel as well as numerous runs of Cat6, is a 24port switch and a 8 port POE switch. Fair enough, plenty of interference potential, but I don't recall changing any of that recently (for it to just drop out). Anyway, whether it's a combination of things, wriggling some wires, resetting some radios in their sockets etc or just now positioning the Gateway further from all the metal, we're back in business. I agree, nothing wrong with the software, but perhaps somewhat sensitive on the environmental factors. I'm looking and investigating for this issue. My network of sensors is located at channel 125, by the way I did notice new troubles when Wifi of ADSL is under heavy load. I did use two different scanner, and this is the output. I don't know if my choice to move the radio to channel 125 is ok. In effect, on the node with relay/actuactor, I have also the traffic light. When wifi is under heavy load, I can see the red led blinking. No red when no wifi is used. 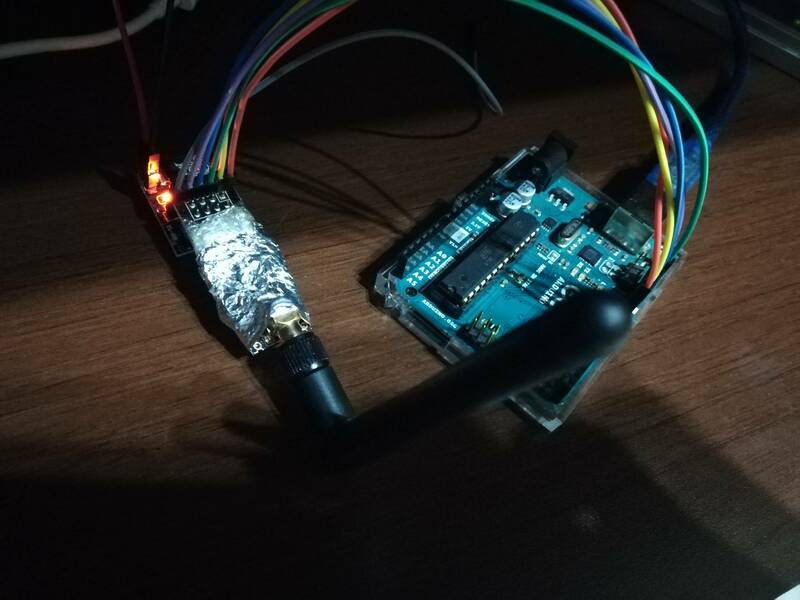 On another website (http://arduino-info.wikispaces.com/Nrf24L01-2.4GHz-HowTo) I did read the hint to move the radios to channel 108. @sineverba I'd suggest that if you can analyze the traffic, pick a channel with low "competing" traffic. Wifi and nrf work in the same band, so it would also to some extent depend on your (and your surroundings) use of various wifi channels. It's difficult to give any recommendations. Just try various and see which have the fewest failed transmissions. I'm investigating on this issue. I'm on channel 125 (last one, the more free channel on my house). I have a node on a custom printed pcb with atmega328@8MHZ and an Amplified Antenna. This node is feeded via a LM11173v3 from a 5V 2A samsung charger. This node also has a 100uF near the VCC/GND of antenna. I have a PI2 + Arduino UNO (genuine!) 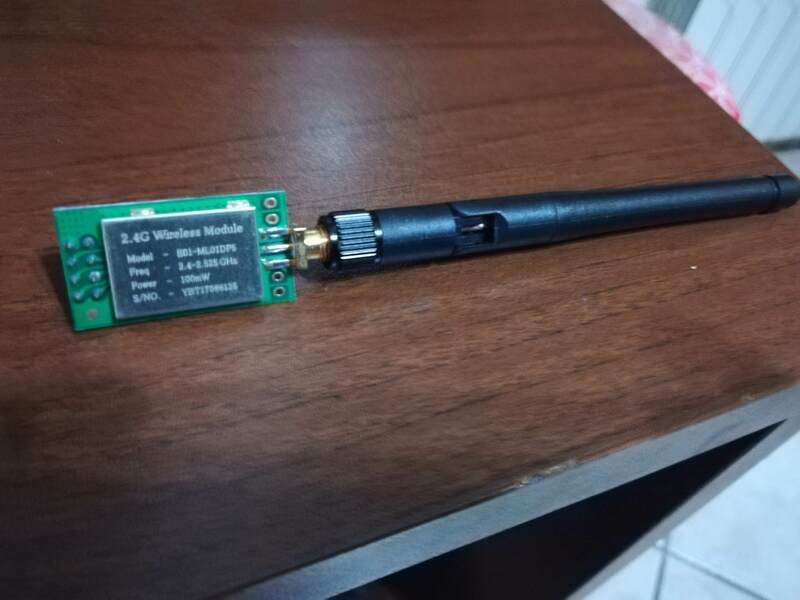 with an amplified antenna with socket module. The amplified antenna is feeded via the socket module from 5V of PI. I did clear the EEPROM of Gateway, reloaded the personalization sketch and the Gateway Sketch. And it goes to "infinity" to 20 and restart. NO missing 1 send in about 30 minutes.. Very happy with this. 7202 Timeout waiting for nonce! 12226 Timeout waiting for nonce! 14299 Nonce received from 0. 19523 Timeout waiting for nonce! 24549 Timeout waiting for nonce! 25100 Nonce received from 0. 26394 Nonce received from 0. 32616 Timeout waiting for nonce! 38643 Timeout waiting for nonce! Sometimes it signs, often no. Could be that ACK // timeout for nonce is too fast? @sineverba great that you got it working. Yes, signing require a solid radio link. It is not so much a matter of "signing is not working" but rather "radio is not working".